Vancouver born and raised, today’s guest, Mike Vilimek, played RB and LB in high school before going on to set school records at Simon Fraser University. 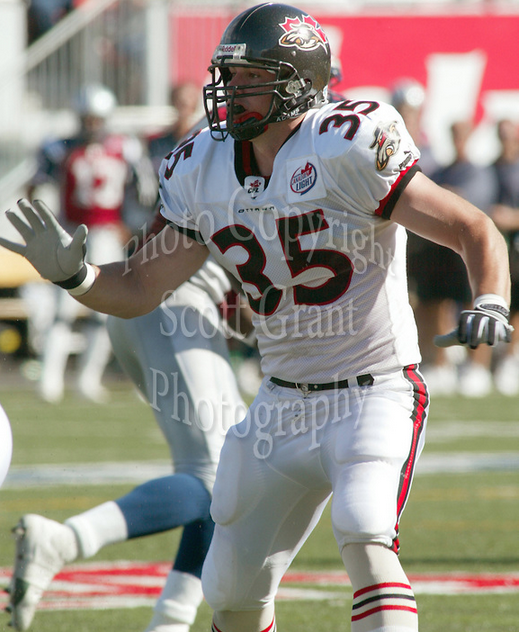 Drafted with the second of two 1st round picks the Renegades held in the 2002 CFL draft, Vilimek played for 3 years in Ottawa before signing with Montreal as a free agent in 2005. As a Vancouver native, did you get out to a lot of Lions games as a kid? Yes. My most memorable was the 1994 Grey Cup, when the Lions faced the Baltimore Stallions. I was only 15 at the time and was offered a pair of tickets at the last minute. After Lui Passaglia kicked the game-winning field goal for the Lions, the building erupted. It was a great experience. 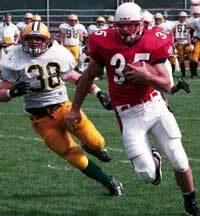 You played university football at Simon Fraser, setting a school record for most rushing yards in a game with 315. What do you remember about that day? Often when a back sets a rushing record, the game is a blowout. Not in this case. We were in a close back-and-forth match-up with Humboldt State University. We ended up needing every one of those yards to beat them 37-34. I also surpassed the SFU single season rushing record that game so it was a very special day for me. The Renegades selected you 2nd overall in the 2002 draft, did you feel any pressure being drafted so high? Not really. All the excitement of the team’s inaugural season plus the fact that every player on the team was a first-year Renegade lessened the focus on rookies like myself. That being said, I had success running the ball in our first pre-season game which I think probably set higher expectations for me than being drafted 2nd overall did. Unfortunately, that success in the pre-season didn’t translate into opportunities to carry the ball in the regular season. 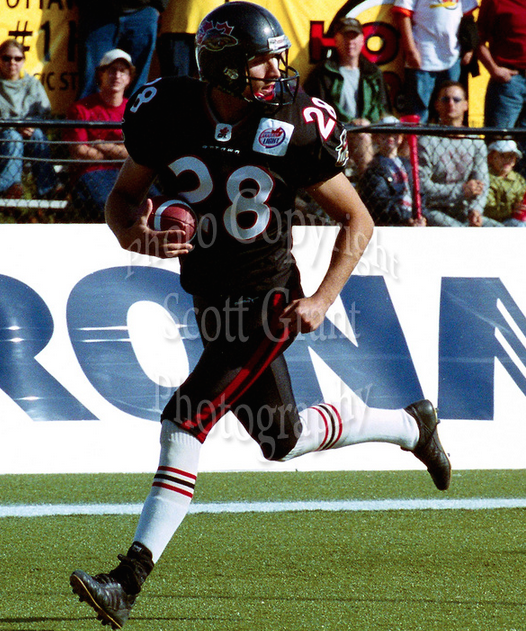 During your time in Ottawa you often were the lead blocker for Josh Ranek, who was nicknamed “The Little Ball of Hate”. As a FB why did you enjoy blocking for a guy like that? Josh got that nickname because every time he touched the ball, he ran with it like he was angry. And he had a lot of success doing it. Off the field, he was very polite, no ego, and was one of the nicest guys on the team. Blocking for a guy like that is always fun. A lot of people blame the Renegades ownership for being a distraction to the team, did you ever feel that way? Not really. I can’t say it was ever a distraction to me as a player. However, I left for Montreal as a free agent after the 2004 season, so I never experienced ownership under the Gliebermans. But if you ask players from the 2005 season, they may have a different story. Throughout your career you were a special teams ace, making numerous tackles on kick coverage. What’s the trick to containing a dangerous returner? Usually a dangerous returner is going to be faster than you, so the only way to contain him is to use the sidelines, your teammates, and by keeping proper angles. You can’t allow him to turn it into a foot race because you’ll lose. How did you pump yourself up before a big game? Some guys like to listen to music or yell and jump up and down. My routine was more about visualization. I’d walk through the game in my mind and visualize the plays I would make. That way when the game started I knew exactly what I wanted to do. What was the best hit you ever gave and the worst you received? The best hit I gave was in a game versus the Hamilton Tiger-Cats. I lined up as a slot receiver just outside the defensive end. The play was designed to come wide to my side so at the snap of the ball, the defensive end came up field thinking he had a free run at the QB. He never saw it coming. It was one of those hits where the guy goes airborne. For the rest of the game, I could see him looking where I was lined up before each play. The worst hit I received wasn’t one of those highlight real hits and it’s not the kind of hit many fans would even notice. When you’re in a pile of people and someone gets a running start at you, the momentum from the hit has no where to go but to be absorbed by your body. Those hits hurt the most. In 2005 you signed with Montreal and went on to become a goal line specialist, scoring 5 TDs that season. Did you do anything differently that year or was it just a case of the coach giving you an opportunity? 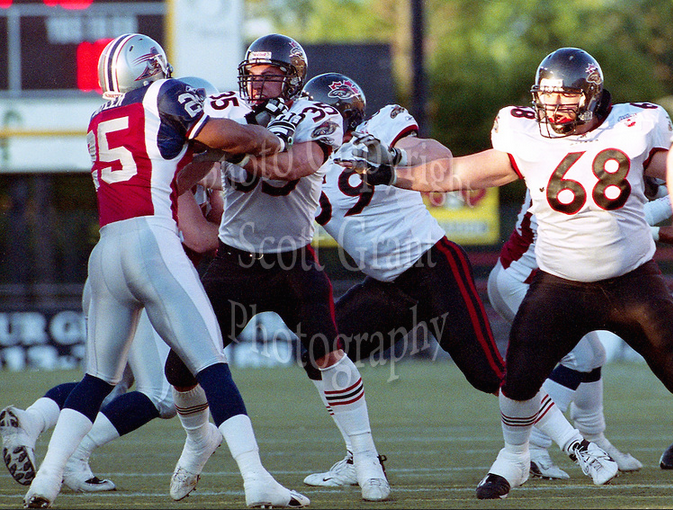 I never got much of a chance to contribute as a ball carrier with Ottawa. I had success running the ball in the pre-season three years in a row, (interestingly enough against Montreal, who I would eventually sign with as a free agent) but that pre-season success in Ottawa never transferred to opportunities in the regular season. In my first year with Montreal, they simply gave me the chance, and I ran with it, literally. Where do you feel is the toughest stadium in the CFL to go in and get a win? Definitely BC Place. In my years with Ottawa and Montreal, we never once got a win at BC Place, regular season or playoffs. We could beat BC at home, but never at their place. Some blamed the 3 hour time change where a 7pm kickoff meant teams from back East were playing starting a game at 10pm. I don’t really buy that, but I don’t have a better explanation either. When I arrived at SFU as a freshman, that happened to be the number that was available. After the success I had at the university level, I wanted to keep the same number. Fortunately I was able to get #35 as both a Renegade and as an Alouette. Are there any losses that still haunt you? Yeah. 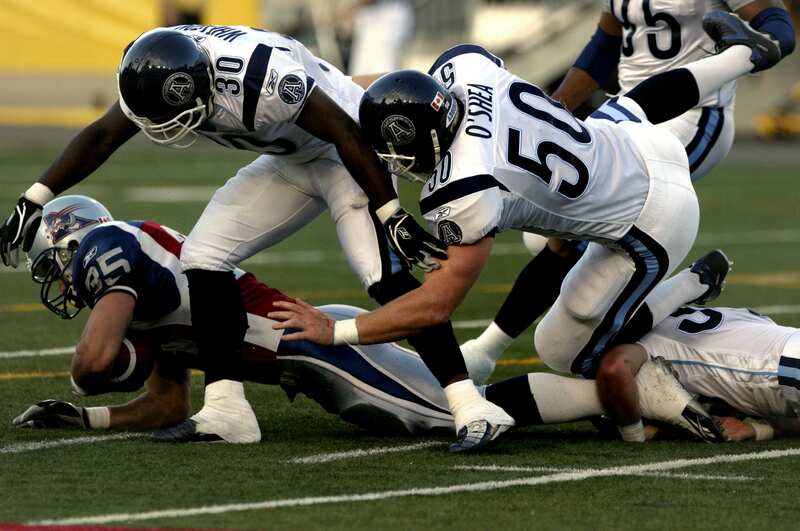 The 2005 and 2006 Grey Cup games. I got to play in two Grey Cups in my CFL career, but ended up retiring without a ring. Any professional athlete will tell you retiring without ever winning the ‘big one’ is tough. I’m a Director at Oracle, one of the largest enterprise software companies in the world. I lead a team responsible for the global go-to-market strategies and activities for Oracle’s HCM Cloud solutions. Did you still keep in touch with any other former Renegades? Not as much as I used to. It pains me to say, but most of the updates I get now come from Facebook. Any plans to return to Ottawa and catch a Redblacks game? Ottawa is a great city, especially in the summer. I haven’t been back since I stopped playing but I hope to make it back soon. I’d love to take in a Redblacks game. Even with the renovated stadium, I’m sure it would bring back a lot of memories. Thanks for your time Mike and hope to see you in Ottawa soon! 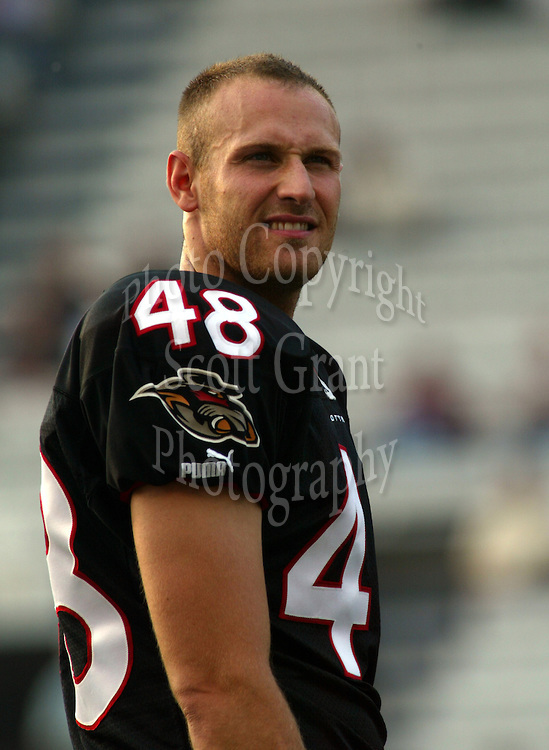 Today’s interview features Ottawa native and former Renegades punter Pat Fleming. With 19,838 career punting yards to his credit, Pat averaged 41.7 yards per kick over the course of his five years in the CFL. 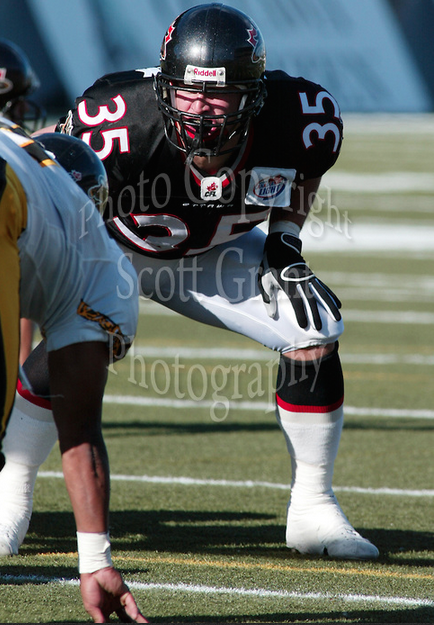 The Renegades’ 2003 rookie of the year was selected by the Hamilton Ticats in the Renegades’ dispersal draft and finished his career with the Winnipeg Bombers. As an Ottawa native, did you go to many Rough Rider games as a child? My dad was a season ticket holder when I was growing up and still is today. I went to a lot of the games with him and loved it. I have lots of memories growing up watching the Rough Riders and actually my 5th grade project was on the CFL and the Grey Cup. Have you always been a punter or did you make the switch from another position at some point? Growing up I played defensive back (DB) and free safety (FS). When I went to college at Bowling Green I went as a safety and punter. Once I earned a scholarship as the starting punter I knew my days playing DB were over. That’s when I became strictly a punter. I started punting and kicking when I was 10 years old when my coach at the time asked us “Who can kick the ball?”. I didn’t know I could until I tried it but I was the best on our team and realized I was blessed with the ability to kick the ball far. The rest is history. The Renegades selected you in the 2nd round of the 2002 draft (11th overall), did you have any idea that they were interested in you? None whatsoever, my mother heard it on the radio and she called me to let me know. At the time I still had a year left at Bowling Green. How did it feel to spend three years playing for your hometown team? It was amazing. There’s nothing like playing on the same field where you grew up watching Rough Rider greats and dreaming about being a professional football player. I enjoyed my time in Hamilton and Winnipeg, but nothing compares to playing in your home town, in front of friends and family. I loved my time in Ottawa. On your first kick you ended up spraining your ankle and missing a few weeks, probably not how you imagined your debut going right? Not at all, but luckily I had a good week in camp before that exhibition game so the coaching staff didn’t judge me on that punt, which wasn’t my best. It happened so fast and I ended up missing the first five games due to that high ankle sprain. Looking back on your time with the Renegades, what sticks with you the most? That I got to play on the same field that Rough Riders like Orville Lee, Rohan Marley, Ken Evraire, Terry Baker, Damon Allen and Darren Joseph played on. It’s funny because when I was in the 5th grade Damon Allen came to my school and talked to my class, 15 years later I’m teammates with Darren Joseph and playing against Damon Allen. Talk about surreal. LOL. Despite being picked off I think both worked out okay. The first pass was a fake punt call in Montreal. I rolled left and tried to throw the ball to the receiver but was picked off. It ended up working out okay as it yielded us about 18 yards in field position. The second attempt wasn’t a called fake punt, but came off a bad snap. I knew I couldn’t get the punt off without it being blocked, so I took off and ran for the first down marker. Initially I saw the chains and thought I could make it, only to realize that I was looking at the beginning of the chains and still had another 10 yards to go with a DB barreling down on me. I reacted quickly and threw towards a receiver, but was intercepted again. We still gained 25 yards so it wasn’t a total disaster. As the punter you often end up as the last man between the returner and the end zone, what kind of things go through your mind when you know that you HAVE to make that open field tackle? I loved it. Growing up playing safety I enjoyed contact and wasn’t shy of hitting. I always used to run down field quickly for two reasons. One was to get involved in the action and make some tackles and the other was because the returners were faster than me. Tackling the extremely fast guys in the open field was very difficult, so by running down field I could contain them in the holes before they’d break free. Could you share with our readers who might not know, why you changed your number from 48 to 28? When I was drafted the coaches asked me if I wanted to keep my college number and I said yes. I ended up changing numbers because we ran a fake field goal where it was a direct snap to our kicker Lawrence Tynes. I was the holder and ran down the line towards the right as Lawrence shovel passed me the ball. It worked great and I gained 18 yards before being knocked out of bounds on the 3 yard line. Unfortunately it was called back on a flag for an “ineligible receiver”. Back then players with numbers in the 40s, 50s, 60s and 70s had to report to the ref before the play. The coaching staff wasn’t aware and so the next day when I came to practice they told me my new number was 28 so that if we ever ran the fake again I’d actually be eligible. What was your favourite fake or trick play to run? The one I just mentioned because it was my play. What I mean by that is that I came up with it in practice and the coaches actually ran it. Did you have any specific pre-game rituals or habits? I’d always go for a walk about 4-5 hours before the game, come back and eat my pre-game meal. What’s worse to kick in, rain or extreme cold? Cold is hard because your hands get so dry and slick that the ball slips out of your hands. You end up constantly licking them to get some tack on them. Rain isn’t much fun either, but the ball boys usually do a good job keeping the balls dry. I always thought the worst were games in late October/early November where it was both cold and rainy. Hang time > directional kicking? I played college ball in the States so hang time was a big deal. I loved punting for hang time. I was blessed with a strong leg so I was able to get great air under the ball. 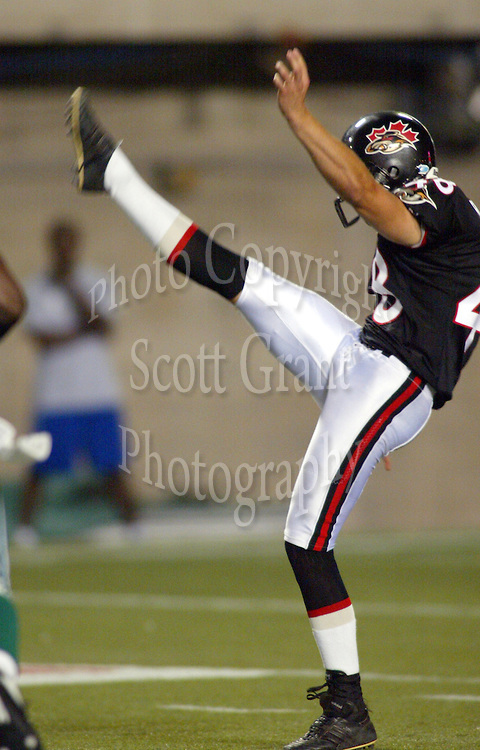 I struggled with directional kicking throughout my career because I never actually had to do it in college. I always preferred punting for hang time as it was more natural for me. Just how hard is it to angle a kick to a certain point on the field? It’s hard because there are factors that people don’t think of such as the snap, blocking protection, wind, the rushers barreling at you and your steps have to be exact. In most CFL stadiums the wind swirls so the direction you see the flags moving on the field isn’t always accurate. Is there one thing about being a kicker that most people probably don’t realize? How athletic you need to be. Kickers and punters for the most part have to be athletic and not just able to kick a ball. Most kickers and punters in the CFL/NFL were great athletes growing up and played multiple position in high school. Are you a fan of the rouge or is there some merit to the argument that it rewards failure? I don’t think it rewards failure and it’s been part of our game for so long so I say keep it. Plus it’s one of those things that makes our game different from the NFL. Since you retired what have you been doing for work? I’m a licensed kinesiologist and the owner of Fleming Fitness. 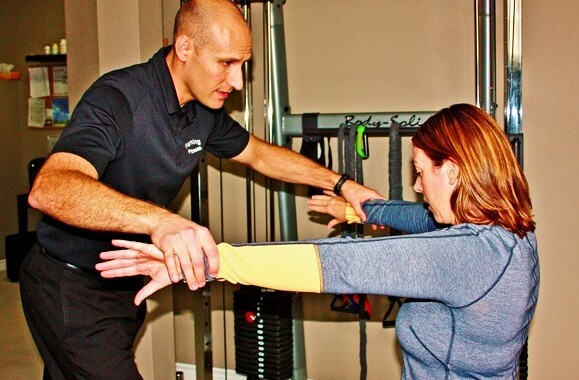 We’re a team of certified trainers and kinesiologists that specialize in injury rehab. We’re mobile, so we go into people’s homes and help them get set up on an exercise program designed for their needs. Have you ever given any thought to coaching? Nah, I try and help out kids as much as I can as a guest coach. That’s the extent of my coaching career. Last year the Redblacks struggled to a 2-16 record, what do they need to address this off-season to ensure they improve next season? First off, I think we were better than our record showed. We competed in a lot of games and lost some really tough, close games. Our defense was great. The offense struggled a bit, but with our new additions to OL and WR I think we’ll be better. Adding Jason Maas as the Offensive Coordinator was a great addition as well. He had a great CFL career as a player and it seems to be translating over into his coaching career. We were teammates in 2006 in Hamilton and he was one of the hardest working guys on the team by far. In terms of special teams I think Maher did a good job punting and kicking. Thanks for your time and best of luck in your future endeavours!